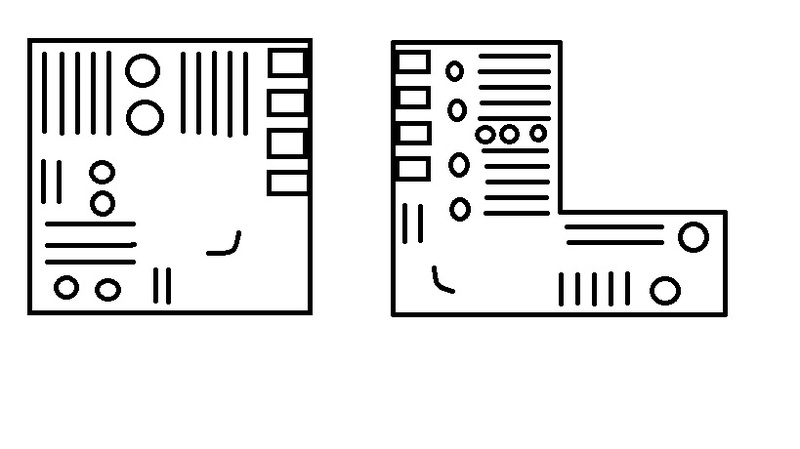 These two illustrations do not really show the complexity of architectural design, which may provide additional space such as meeting rooms, reading rooms, and any other nook and cranny, but I want this to be relevant to the most basic of library spaces. 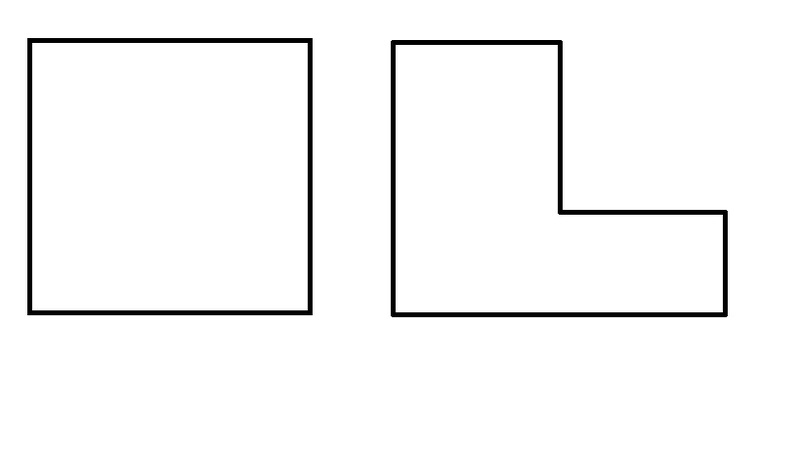 Therefore, the space that customers occupy can usually be broken into a Square or L-shape schematic like these. Now that we have space, consider everything that will go into the library - tables, chairs, computers, and shelves are the basics. 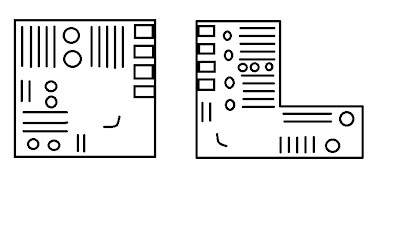 In order to break up the negative space, we use furniture to form sections of the library varying by collection type. The most common furniture used to make these distinctions are shelves. 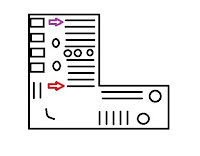 In an L-shaped library, it is common practice to put children's materials on one side while having adult and other study furniture on the opposite side. In a square shaped space, a little more effort must be applied. It gives a sense of privacy, as most people using public computers must do so to conduct private business when there is no home computer in the household. Computers generate noise as well, and this secludes them from the study area in the center of the library. Computers placed in the back (like milk in a grocery store) forces customers to unconsciously browse the library. 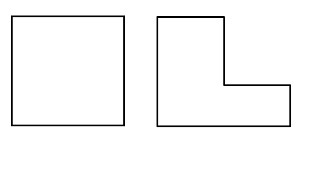 In the L-shaped layout, the same counter-clockwise rotation is true, keeping in mind the children's area, young adult section, computers, and adult study areas. You may have noticed some negative space remaining in my crude drawing. I'm sure that you are thinking of multiple sections I've left out or displays that have not been considered, and you would be exactly right. We'll get to that in my next post, Library Design 101: Designing for the Future. 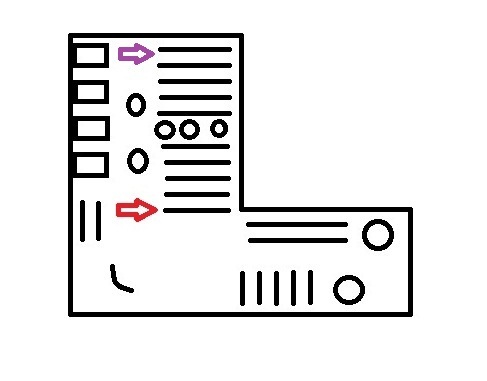 In the L-shape design, considering you enter the building from the bottom left corner and proceed to the adult collection, should the non-fiction section (Dewey 001-999) begin at the red or purple arrows?